Minn Kota Terrova Bow Mount Motor, 55 lb/45"
The Minn Kota Terrova trolling motor provides a Mountain of features such as a balanced motor design with a stow and deploy lever that makes stowing easy, and a Master cut-off switch that automatically turns off the motor when stored. 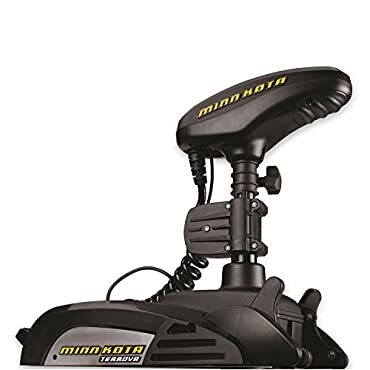 The foot pedal provides responsive, precise control from anywhere on the boat with less than one degree of steering resolution, while digital maximizer draws only as much power as you need, smartly conserving energy to provide longer run times. The most technologically-advanced motor also packs up to 112 pounds of thrust. It starts with an easy stow/deploy lever, responsive control and big-time power. And when you add options like I-pilot, I-pilot link or universal sonar 2, there's no limit to where Terrova can take you. How can you possibly improve a motor with up to 112 pounds of thrust and I-pilot or I-pilot link compatibility by making it easier than ever to stow it with an innovative lift-assist mechanism. Now you get brains, brawn, and effortless control of it all. Hey, we like a challenge.